What in the world could be better than being the father of the POTUS? Being the President yourself! Indeed, George H. W. Bush got the very best of both worlds. He will forever be known to the world as the 41st President of the United States (1989-1983) as well as the father of the 43rd president of the United States George W. Bush. George Herbert Walker Bush was born on June 12, 1924, to Prescott Bush and Dorothy Walker Bush in Milton, Massachusetts. The family relocated to Greenwich, Connecticut where he attended the Greenwich Country Day School. He later studied at Phillips Academy in Andover, Massachusetts where he displayed remarkable leadership abilities both in the classroom and on the sports field. His plans of going to college were truncated when the United States entered the 2nd World War in December 1941. The then-18-year old George Bush enlisted in the US Navy, making him the youngest pilot in the Navy at that time. While serving in the US Navy during WW II, George Bush had his plane shot down over the Pacific Ocean. Fortunately, he was saved from being captured by the Japanese forces by the famous lifeguard submarine USS Finback. On January 6, 1945, George Bush got married to his wife of 73 years, Barbara Bush (née Pierce). When WW II ended in September 1945, he promptly returned to his education and enrolled at Yale University. George Bush Snr. was the captain of his college baseball team during his senior year at Yale. He was opportune to meet legendary American baseballer Babe Ruth a few weeks before the latter passed on in August 1948. George H. W. Bush graduated in 1948 with a Bachelor of Arts degree in Economics. Upon graduation, he relocated his young family to Texas. With the help of his father’s connections, he ventured into the oil industry, working as a merchant of oilfield equipment. After years of hard work, George Bush Snr. co-founded the Zapata Petroleum Corporation in 1953. A year after, he was made the president of the offshore drilling subsidiary known as Zapata Offshore Company. He moved his family to Houston in 1959 and by 1964 he had made his first million. After that, he switched his interests to public service and politics. The political career of George W. H. Bush was that of a steady ascent through the ranks of several political offices till he reached the zenith. Prior to his one-tenure stint as US president, George H. W. Bush served as Congressman, US Ambassador to the UN, Director of the CIA and as Vice President of the US. George W. H. Bush was the longest living President of the United States. In 2017, he surpassed former US president Gerald Ford (1913-2006) as the longest-lived US president. He was also the oldest living vice president of the US. On November 30, 2018, the legend passed on at the ripe age of 94 years and 171 days, holding the rank of the longest-lived president of the United States. The marriage between Goerge W. H. Bush and Barbara Bush was the longest presidential marriage in the history of the United States. The couple had a total of 6 children together – George W. Bush Jnr. (born in 1946), Robin Bush (1949–1953), Jeb Bush Sr. (born in 1953), Neil Mallon Bush (born in 1955), Marvin Pierce Bush (born in 1956) and Dorothy Walker Bush (born in 1959). Tragically, the Bush family lost their daughter Robin Bush at the age of 3. She died of leukaemia a few weeks before her 4th birthday. In her honour, the Bush family set up the Bright Star Foundation to help create awareness about the condition. In 1964, Conservative Republican George Bush. lost his first bid at getting into the United States Senate. 2 years later (1966), he made history as the first Republican to represent Houston in the United States House of Representatives. In 1970, having relinquished his House seat, he lost his second bid to get into the US Senate. From 1971-1973 he served as the United States Ambassador to the United Nations. He also served as the Director of the CIA from January 30, 1976, to January 20, 1977. In 1980, George Bush Snr. made his first attempt at the US presidency. However, he lost out on the Republican party’s nomination to Ronald Reagan. Reagan eventually selected Bush as his vice presidential nominee and the duo won the election. In 1984, Reagan and Bush were successfully re-elected for a 2nd term. He won the United States presidential election of 1988 against Michael Dukakis of the Democratic party. On January 20, 1989, he was inaugurated as the 41st president of the United States. In 1992, he lost his bid for a second term to the then-Democratic challenger, Bill Clinton, marking his final exit from public office. After losing out of his reelection bid, George Bush Snr. retired with his wife Barbara in 1993. The power couple, however, were able to nurture a new generation of powerful politicians within the Bush family. From 2001 to 2009, his first son George Bush Jnr served as the 43rd President of the United States, making him the 2nd US president, after John Adams to father another president. Again, his second son Jeb Bush served as Governor of the US state of Florida between 1999 and 2007. 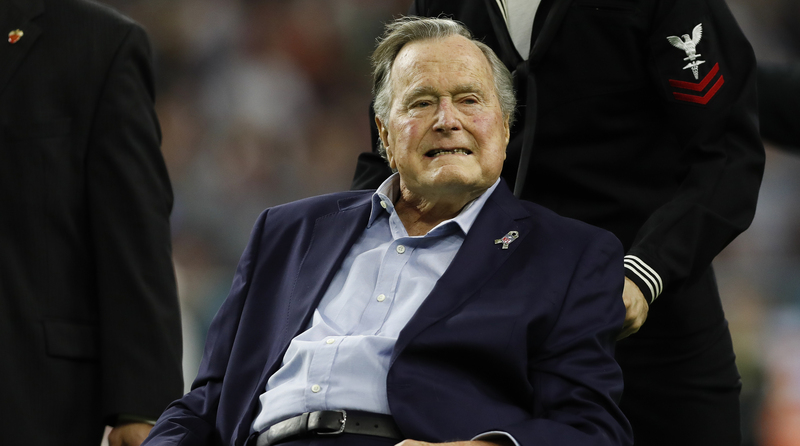 Despite his age during his last days, George H. W. Bush still maintained his great physical assets and stood tall at 6′ 2″ or 188 cm. Details about his weight and other body measurements are not available.